How the wedding of a princess and a set of stamps captivated a nation and a hobby 50 years ago. 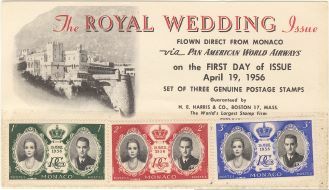 When one looks back over five decades and notes that the glittering royal wedding of Miss Grace Kelly, movie star, to Prince Rainier III of Monaco took place in 1956 only nine days before the world’s largest stamp show was to open in New York City, one can’t help but wonder if, somehow, the two events had been professionally coordinated. The tiny principality of Monaco on the French Riviera, in spite of its world famous casino and five star hotels, had always depended on stamp collectors for a substantial portion of its income. And of course, when it was announced in late 1955 that the country would issue a gorgeous, colorful set of stamps to honor the April 19th marriage ceremony, the philatelic world knew that the postal emissions would be the focal point of attention at FIPEX, the Fifth International Philatelic Exhibition set for April 28th to May 6th. “Focal point of attention” would have to be an understatement. “Feeding frenzy” would be a more apt expression of the reaction by collectors when the stamps were issued. But Grace Kelly was used to to this kind of attention. In the history of America’s motion picture industry, there are few stories to match her rocket-like ascent to fame. The Philadelphia society girl had burst into the screen world in 1951 at the age of 22 in the film, “14 Hours”—not long after being discovered as a fashion model. Her next film in 1952 (“Mogambo”) had her opposite Clark Gable, only 30 years her senior. And by 1955, she had won the Best Actress Oscar for her role as the suffering wife of a Broadway alcoholic. In four brief years she had pretty much “been there, done that” in the movie industry. Miss Kelly and Prince Rainier met when she attended the Cannes Film Festival in the summer of 1955—and by the end of that year it was announced that the two would wed the following April. It was a whirlwind courtship that, even for a prince and a movie goddess, was surprisingly brief. During this period of courtship, Rainier not only had to propose marriage, he also was impelled to stipulate that the world’s most famous film star give up her career. Grace didn’t want to do it, but she relented when her family glowingly approved of her husband-to-be. If you were a stamp collector in the mid-50s when television was in its infancy, you may have been following these events on one of the three network newscasts each weeknight, or more probably, at the local movie theater where newsreels like Fox Movietone News and Universal Newsreels. And being the smart philatelist, you had predicted a set of stamps would be one of the main features of the coming nuptials. The wedding took place on April 19, 1956, just nine days before FIPEX opened its doors at the Coliseum in New York City. Long before then, the Monaco Postal Authority had made arrangements to make sure the set of eight commemorative postage stamps would be widely distributed to the world philatelic community. Various philatelic and non-philatelic firms were given the privilege of issuing first day covers for the postal emissions. Not only did the Monaco governing entities issue their own colorful FDCs, but so did Pan American World Airways, and American philatelic firms H.E. Harris and Co., Artcraft Engravings, and the Gimbel’s Department Store stamp department. In addition, the Authority arranged with the Minkus Publications organization to act as distributor for the stamps to the American stamp dealing community. The latter move made sure the stamps were a big hit on the floor of the FIPEX exhibition. As a result, the Kelly-Rainer wedding set was the chief hit of the show right behind the stamps issued by the U.S. on the occasion of the exhibition. Today, 50 years later, the stamps are highly collectable, but most sought after of all are used copies and commercial usages on cover. A very nice little collection can be formed of them!